I have to admit, as much as I enjoy world history, I have always struggled to embrace ancient Mayan culture. 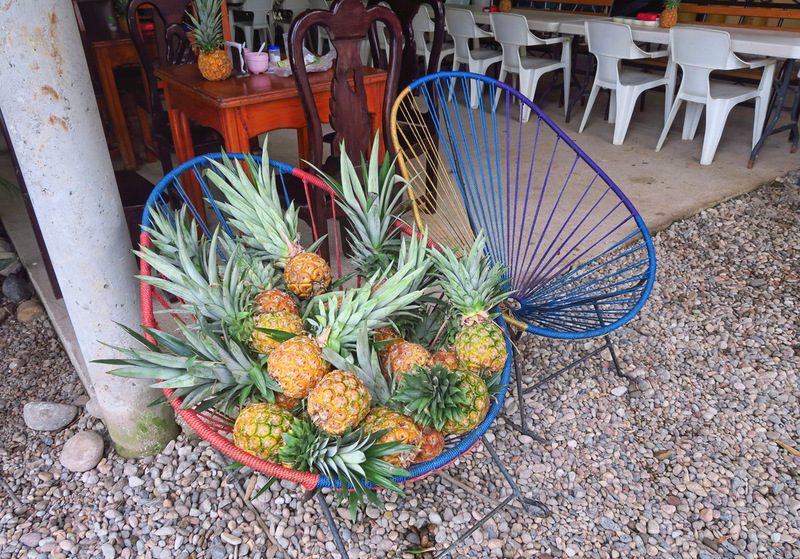 So a couple of years ago when my brother Don sent back photos of Mayabell, the jungle lodge in Palenque, complete with stories of hearing howler monkeys and photos of floating in the refreshing pool, it was the jungle that intrigued me. Two years later, I hadn’t stopped thinking about that jungle lodge. I had to go there. 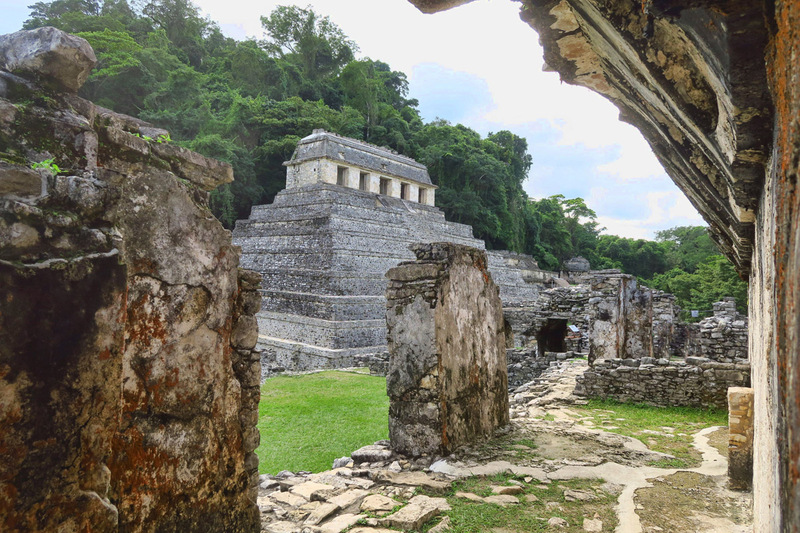 One of the most significant architectural sites in Mayan history, Palenque, was just a sideline. 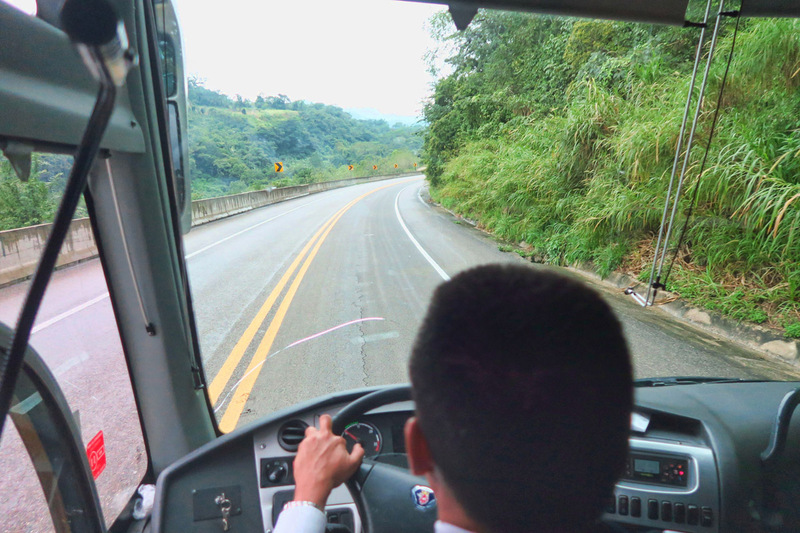 It’s about a nine hour bus ride from San Cristobal to Palenque, but very scenic, and downhill all the way. 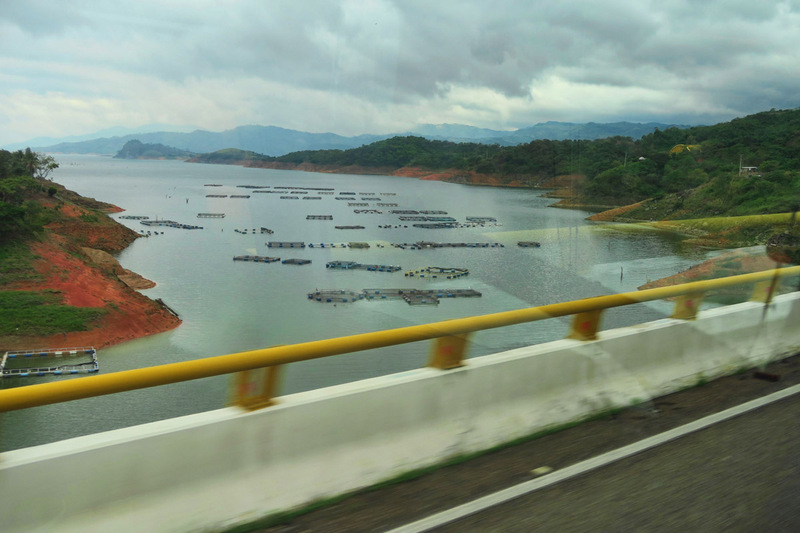 We pass a large lake where there appears to be a lot of fish farming. 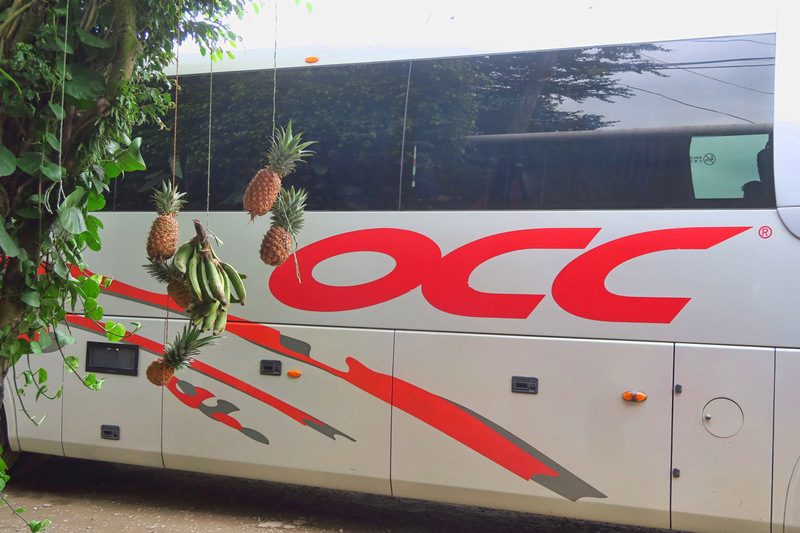 The ADO bus line has several “tiers.” OCC is not quite as luxurious as their ADO Gold Line, but still a comfortable ride. 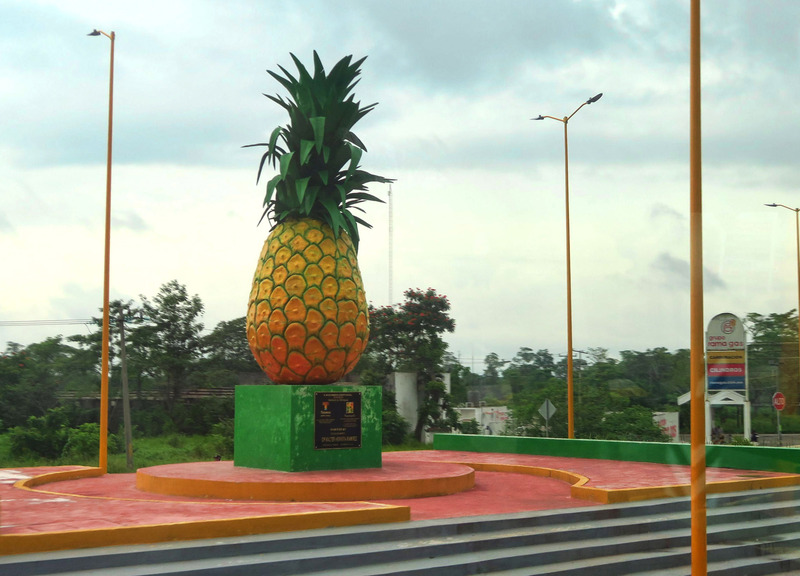 We drive through a major production area of pineapples. 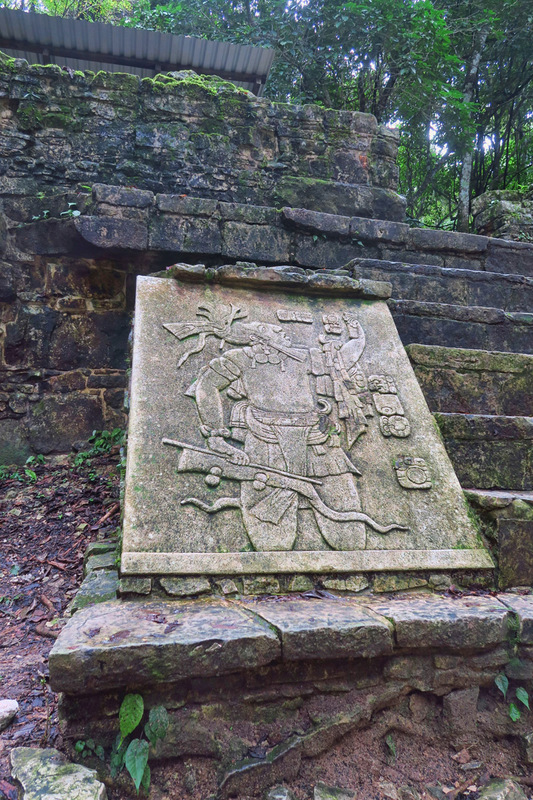 Mayan culture is based a lot on mythology, legends, and lore. Many of their Gods take on animal alter egos, like two-headed serpents and the jaguar god of the underworld and lots of other esoteric stuff, making it impossible for me to mentally engage. Clearly there were some serious hallucinogenics involved when communicating with that spirit world! I guess it is my “left brain,” the same reason I can’t get into Lord of the Rings or Harry Potter, because I am a realist, and not much into mysticism or mythology. 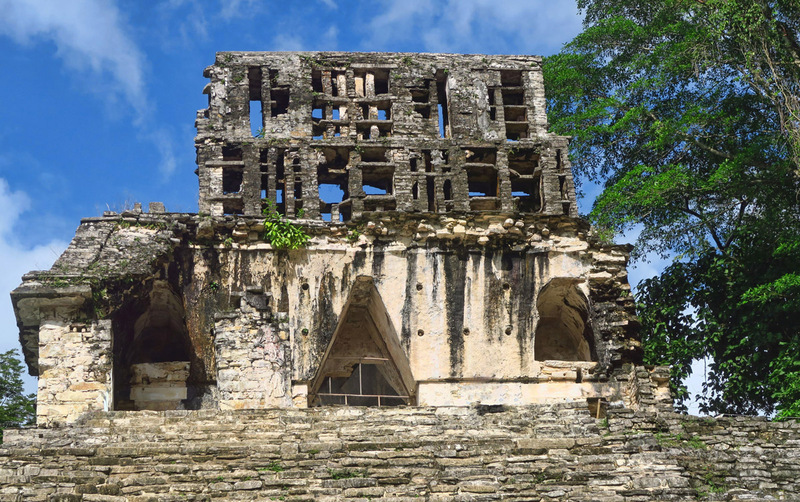 But at the same time, I have to wonder what the Mayans would have thought about my own religious upbringing, which began with an apple-tempting serpent, man eating whales, and multiplying loaves and fishes while people turn to pillars of salt. So who am I to judge? 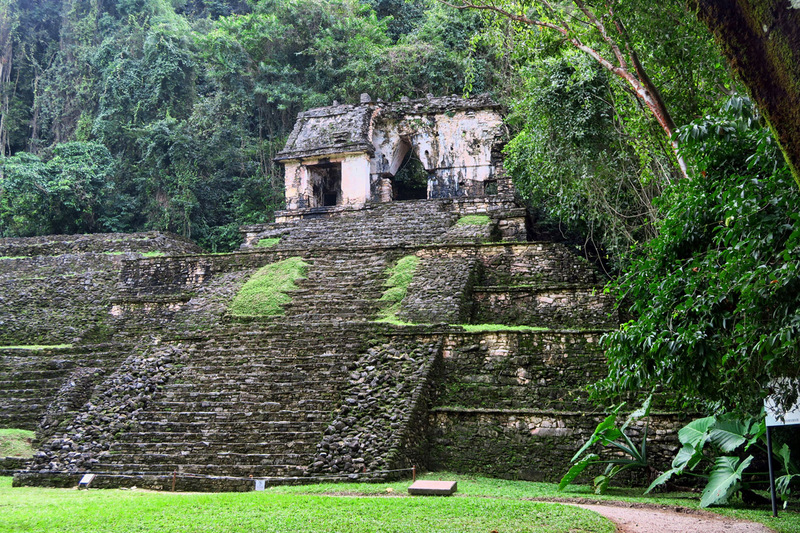 Within the archeological site of Palenque 1,400 buildings have been recorded, of which only about 10% have been explored. 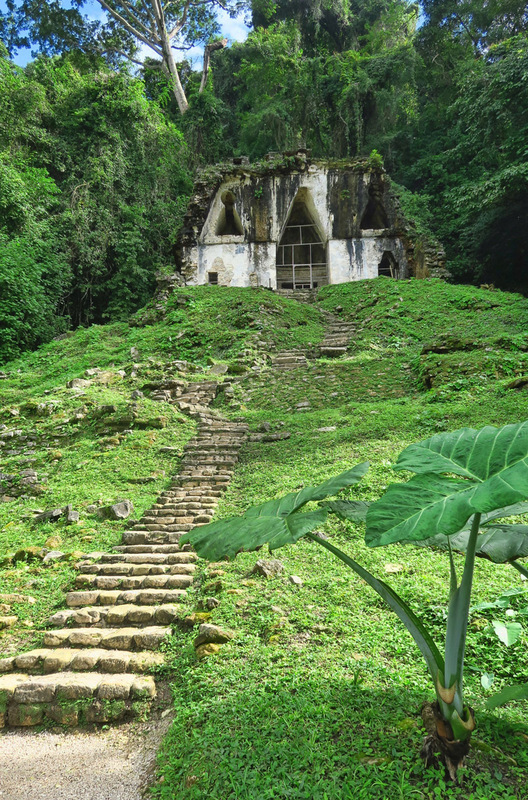 Temple of the Skull, named for a stucco relief image found at the base of one of the pilasters of a skull, believed to be rabbit. This is the main palace, built mid-7th century AD. The larger buildings all contain an elaborate labyrinth made from impressive stonework. 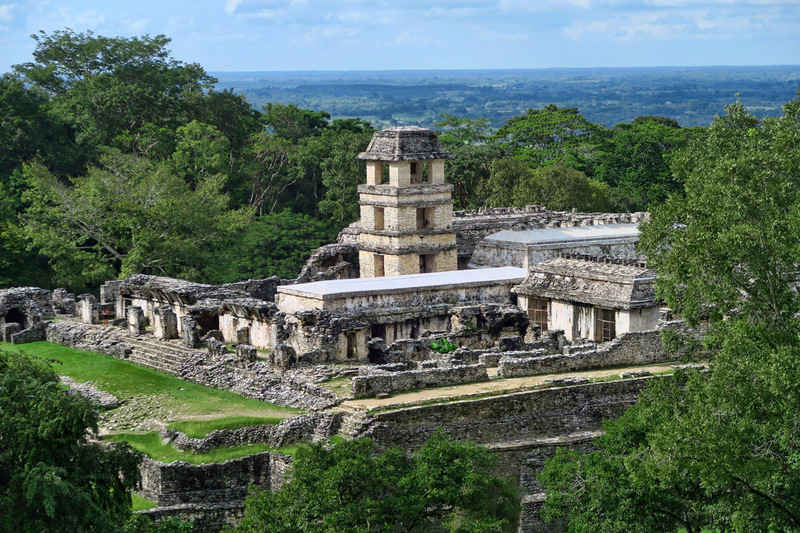 Palenque, dating from 226 BC to AD 799 is considered to be one the most significant Mayan sites containing some of the finest architecture, sculpture, roof comb and bas-relief carvings the Mayas produced. How could I pass that up simply because it’s not something I understand? I could either choose to do a “been there, done that” walk through, or I could delve a little deeper in trying to understand one of the most sophisticated societies known for its complex writing system, its art, architecture, mathematics, calendar system, and astronomical studies. Temple of Inscriptions, named for three tablets at the top containing over 600 glyphs (think stone-carved emojis.) 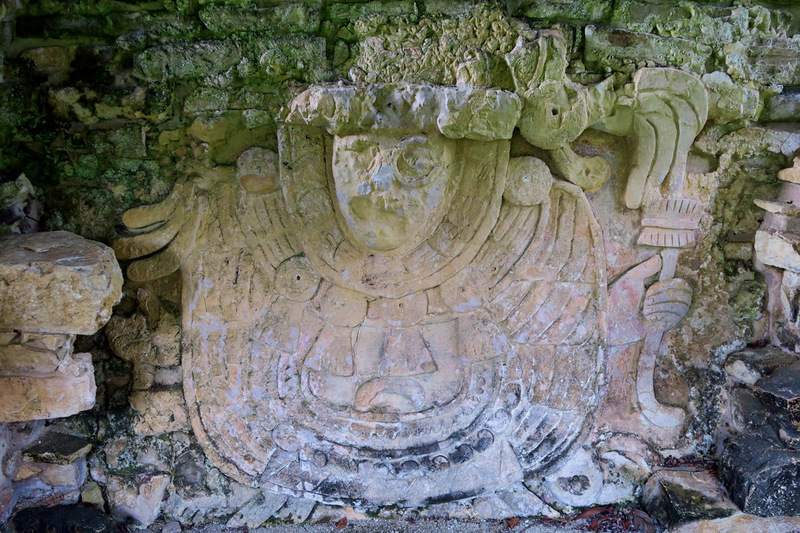 These have been translated to the history of the birth and death of Pakal and his ancestors. His tomb was discovered here in 1952. 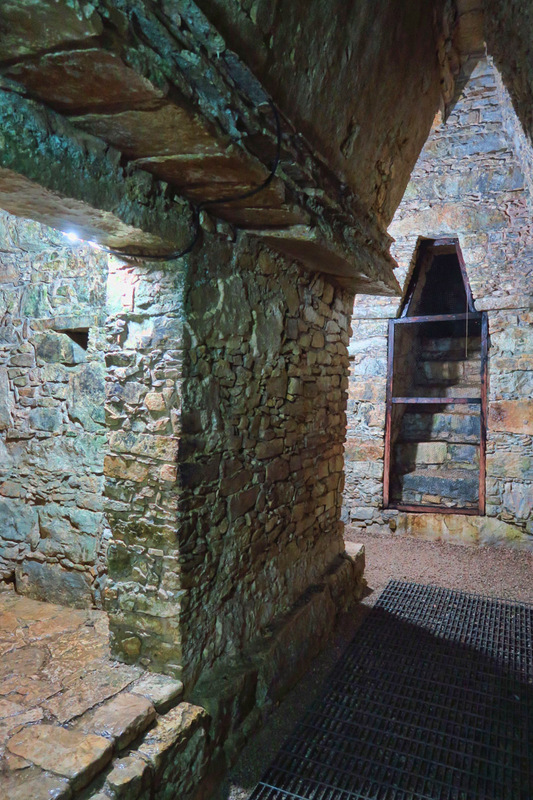 The monument has been restored, though some sections of the original building can be seen such as the first section of the base next to the staircase. Part of the Temples of the Cross complex. This stone-carved tablet was just discovered in 2002. These smaller temples had fewer tiers. The more important the purpose, the more tiers, some reaching up to nine. In the left of this photo, it’s easy to see how sloping green hills can conceal archeological sites beneath. I decided to start small. I would focus on the architecture, something tangible and not of the supernatural that I could see, touch, and appreciate. Consider that most of the original buildings were constructed around the time of the birth of the Christ was taking place, yet their structures are still intact enough for tourists to crawl all over them taking selfies every day. 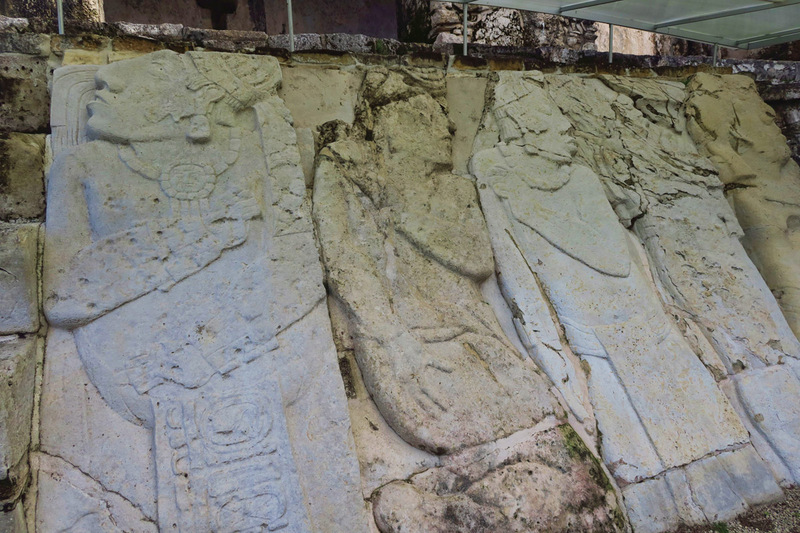 Their hieroglyphs are still visible enough to be sketched and translated, and their stone calendars were considered valid enough to cause some angst until the passing of Dec 12, 2012 for fear the end of the Mayan calendar also meant the end of the world. This speaks volumes about their masonry skills, let alone architectural design. A good example of the ornate decorative facade known as “roof comb” built at the top of all the temples. Most temples still allow climbing of the stairs. It’s a cool morning, so I climb as many as are open. The “tower” seems a bit out of place to me, but there are photos of early discovery that show two thirds of original tower in tact. What is seen today is restoration. 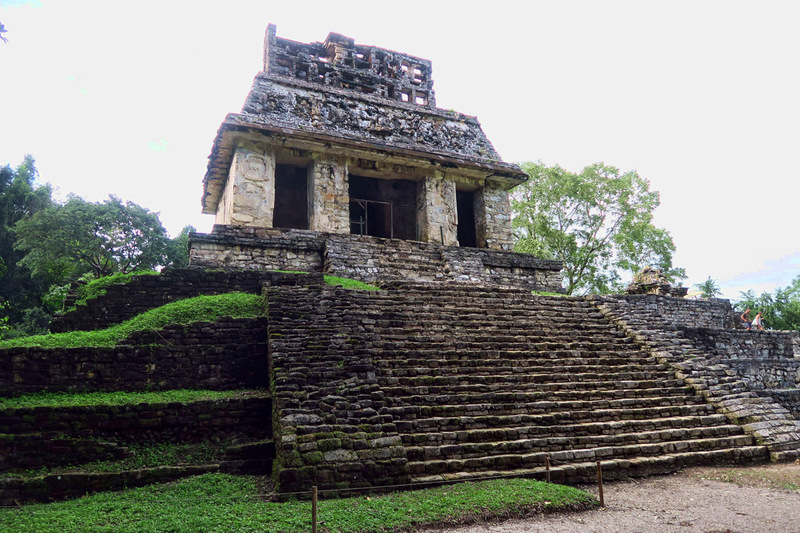 But Palenque has another claim to fame – it contains the first tomb found in any Mayan pyramid, the most famous ancient royal burial in the Americas, equivalent to King Tuts tomb. 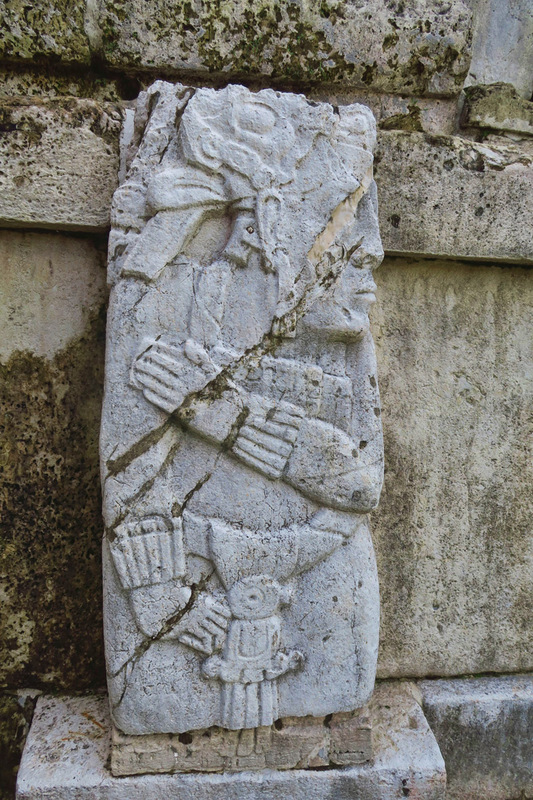 The Mayan culture was ruled by royalty, with the most famous ruler of Palenque being K’inich Janaab Pakal, or “Pakal” for short, also know as “Pacal the Great,” who ruled from 615 to 683 BC. 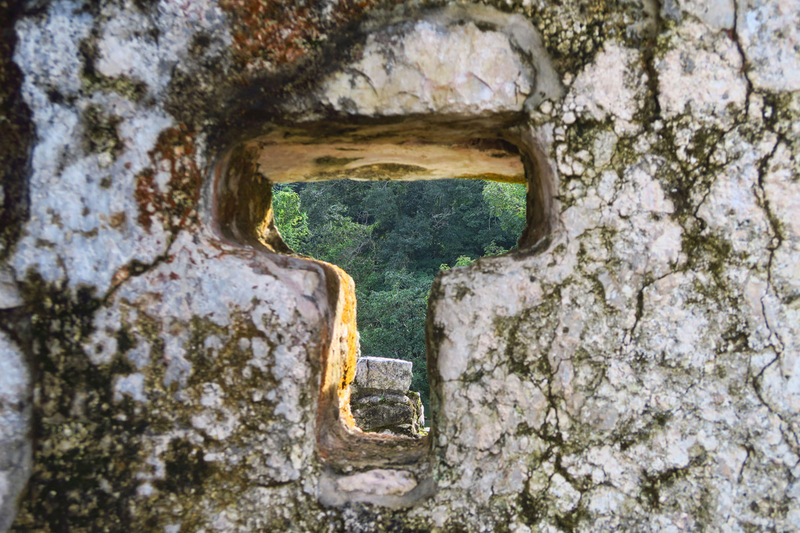 Throughout the palace, they carved these T-shaped windows. As I understand it, it has something to do with the “god of wind.” I remember seeing something similar in Chaco Canyon in NM. Every passageway has this corbel vaulting, an upside down V shape which helps support the structure. 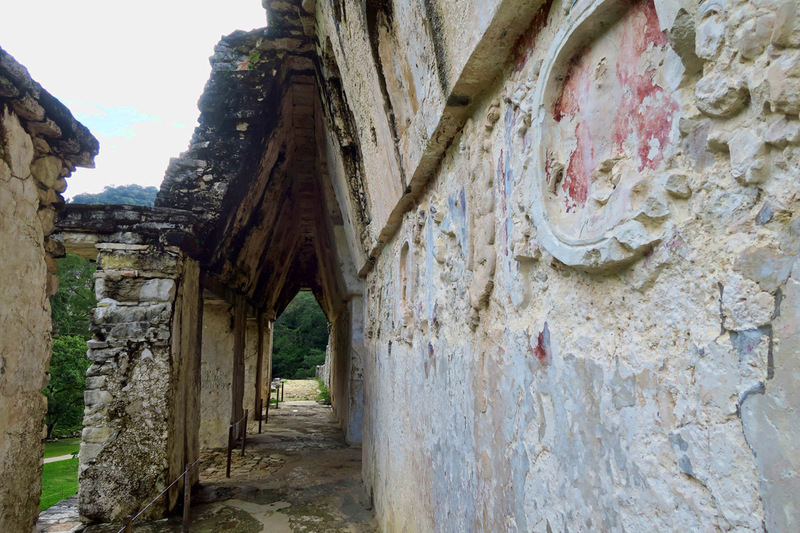 Note also bas relief and remnants of painted stucco remain on the walls. The palace had two courtyards, one on the east side, another on the west, believed to have been used for reception of visitors or presentation of captives from nearby tribes. 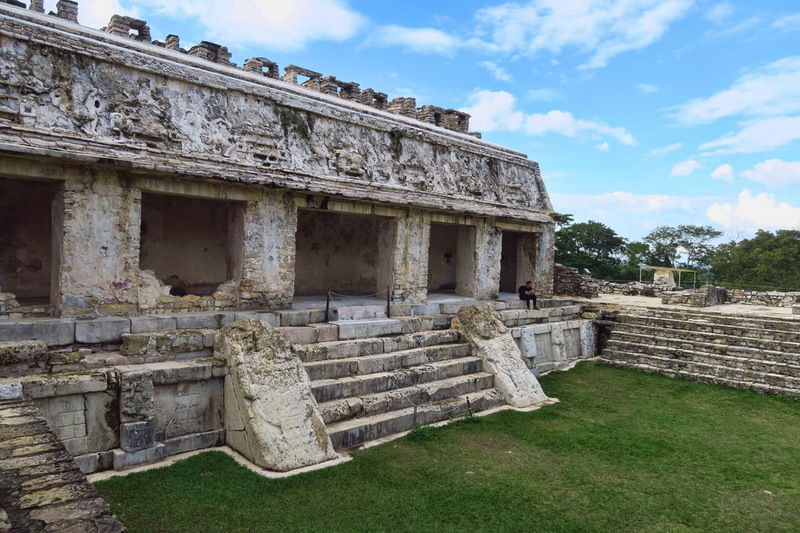 In the late 40’s, Mexican archeologist lberto Ruz Lhuillier was working in the Temple of the Inscriptions when he noticed one of the slabs on the floor of the upper monument was loose. He lifted up the slab and found two steps. It would take him four years to excavate another 70 steps to reach the bottom of the tomb where he discovered a perfectly preserved sarcophagus, not seen by another human for 1,000 years. It was covered by an intricately carved stone slab weighing 5,000 tons. At the time of excavation, it was the richest and best preserved of any burial known from the ancient Americas. Exloration is more meaningful because all information kiosks include English translation. In addition to being written in Spanish, they are also written in Tzeltal. In the State of Chiapas, eight languages are spoken in addition to Spanish; tzeltal, tzotzil, tojolabal, chol, lancandon, chuj y Zoque. 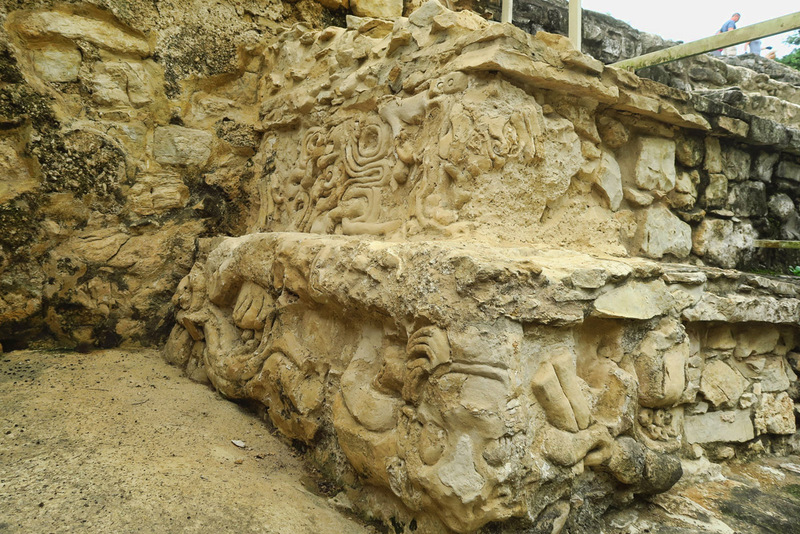 This carving is believed to be of deities. There are housing facilities onsite for archeologists doing ongoing excavations, research, translations, etc. Pakal was estimated to be 80 years old when he died, having begun his reign at 12 years old and ruled for almost 70 years. 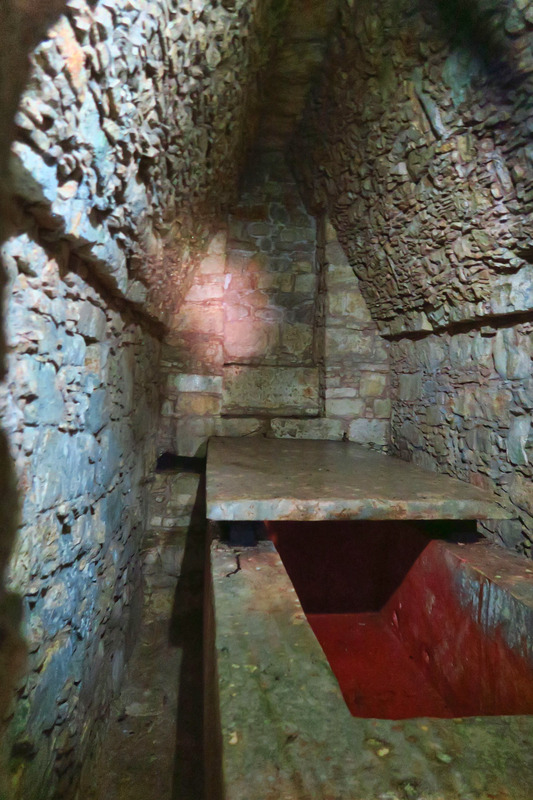 Inside the sarcophagus, they found his skeleton covered in cinnabar, adorned with over 1,000 pieces of jade, and his skull covered by a jade funerary mask with eyes made of obsidian. Pretty impressive to think all this building took place almost a thousand years before the Mayflower set sail! 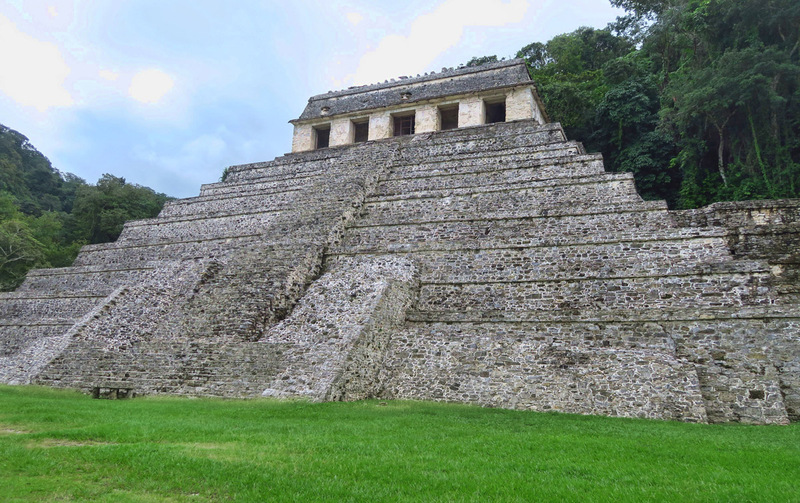 I have to say, after spending almost the entire day at Palenque, I left with a greater appreciation and curiosity than I have ever had when visiting Mayan sites in the past. Not only did I marvel at their ability to construct these gigantic pyramids with perfect precision, using the sun and solstice as their compass and chisels to hand carve the stones, but I also learned more about their intelligence level whereby they created syllabic vocabulary, a numbering system, art, and a calendar that lasted almost two thousand years. I left wanting to know more…. 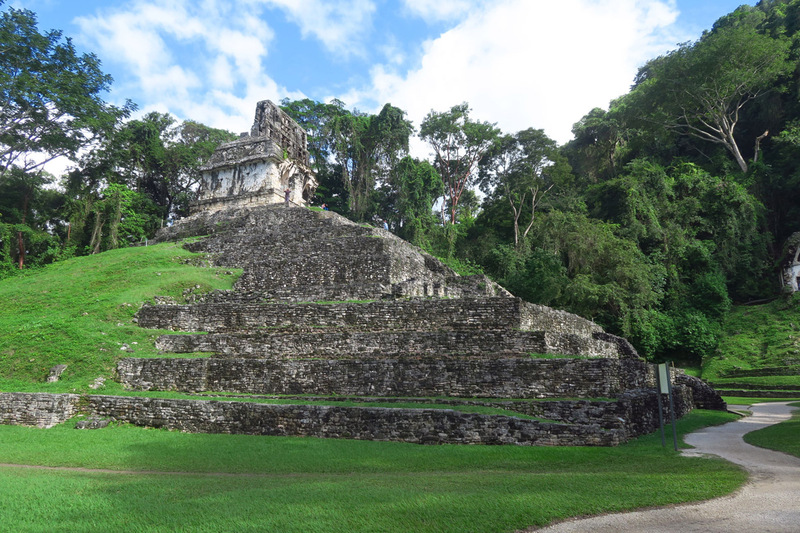 This entry was posted in Palenque and tagged Mayan Archeological Site by Suzanne. Bookmark the permalink. Fascinating! 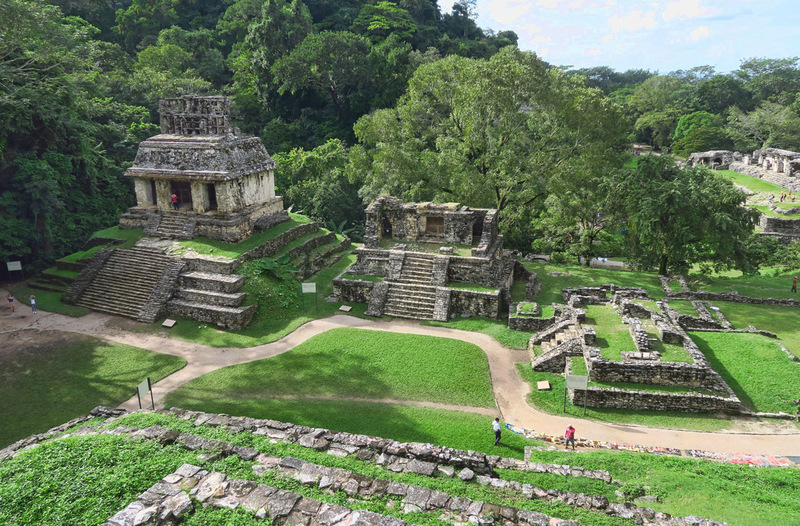 The Maya, other Central America cultures, and the Inca are an interesting study. Although not specifically about the Maya, you might enjoy a couple of books I have just read: Turn Right at Machu Picchu by Mark Adams and The Lost City of the Monkey God by Douglas Patterson. 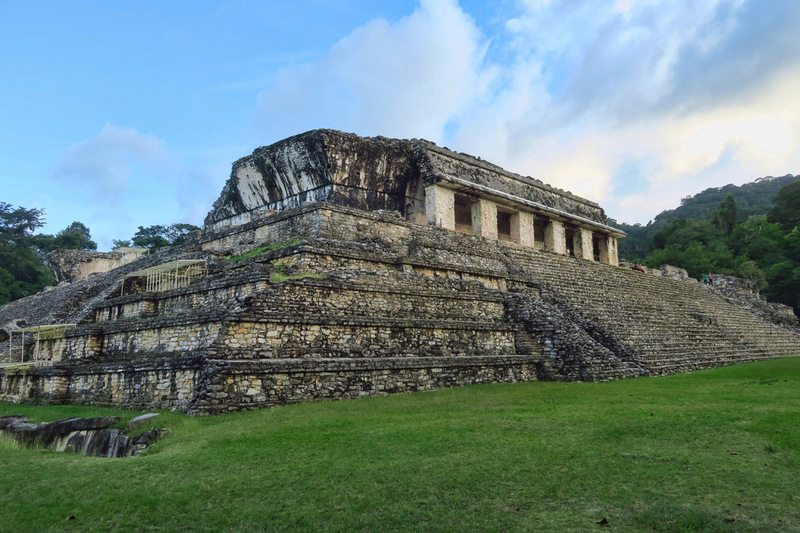 Both deal with the early discovery and exploration of ancient pre-Columbian sites and give interesting insights into a few of the early American cultures. I have appreciated your postings on Oaxaca and past postings on Guanajuato. We will be spending 5 weeks in March and Aprril wandering the streets of those two cities. Your blog is better than the available guide books. 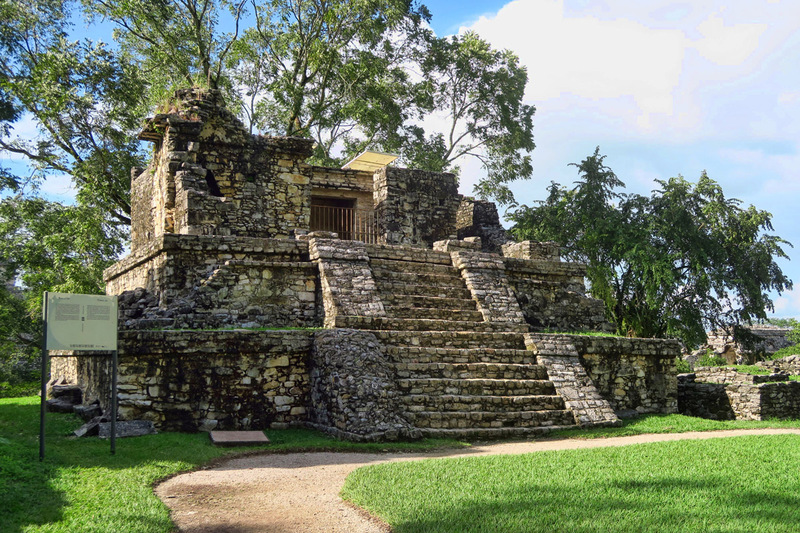 Frank Lloyd Wright was also intrigued by the Mayan architecture as reflected in some of his designs. When I see these old ruins in Mexico, in Europe, Peru etc. it’s amazing to me, too. The labor! and the sophisticated thought-process behind it all. What a wonderful trip. Its interesting that some of the monasteries built in the Middle Ages have cloisters very similar to the courtyards. We are with you on the whole “left brain” thing but it is interesting to hear other cultures beliefs and thoughts. You have to wonder how they built all those structures back in that time period. I have always noted the craziness of dissing mythic beliefs while we think ours are absolute truth. I think I started questioning the current mythology when I was about 7. Still do. Difference is, I do love mythology and trying to imagine how it might have been to live through some of them, especially the Minoan culture. Humans are a strange and magical bunch with the power to create incredible things and to destroy it all completely. Kinda wish I knew how this story of ours was going to go, but I won’t be around to see it. Loving your Mexico posts, even though I haven’t been commenting as much, since we are traveling, but I am here, and I do read, and thank you again for your in depth, creative, beautifully photographed, and thoughtful stories about the worlds that you visit. This blog is fascinating. We of European heritage have cultural norms which have made appreciation of non European cultures difficult to acquire and develop. I have spent hours wandering and wondering about the cities and homes of the south west US which were occupied and abandoned when many of our ancestors were still living in wooden shacks. Your pictures and text describing the civilization of the Mexican people are fascinating, educational and enlightening to me. Thank you for the depth and feeling that you explored these sites. I have always wondered why the native Americans, ie those who came here from Asia and not Europe developed fantastic civilizations, ones which had some blood thirst characteristics, but as you pointed out, more than that art architecture, religions, laws and languages the equal of the Europeans. Unfortunately they did not develop the military tools and skills to adequately defend their cultures from the European invasions. Sad, but thanks again for showing their side. Really enjoyed your post and photos. 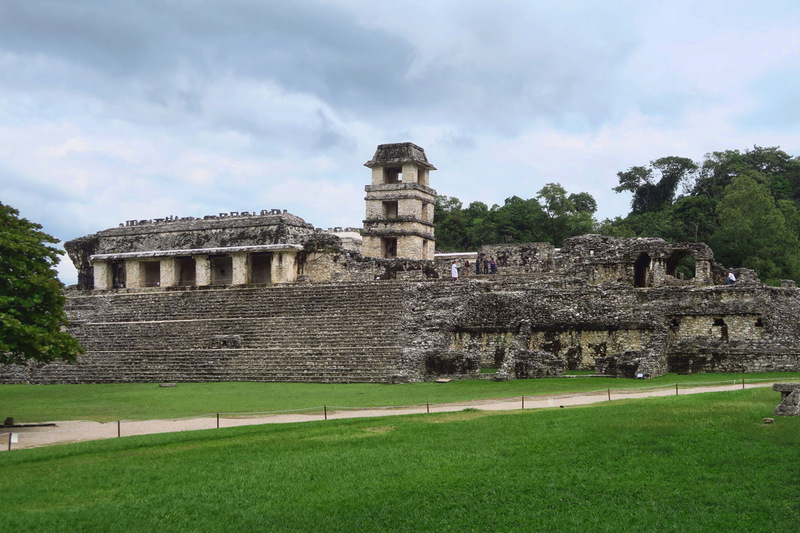 I’ve been fascinated with the Mayan and Incan ruins since visiting Uxmal many years ago. 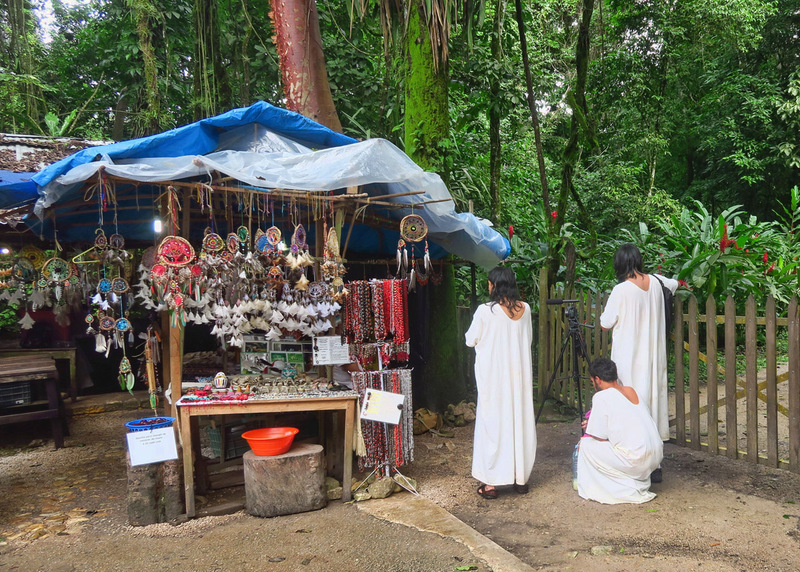 The photograph that knocked my socks off was the one of the roadside stand with the Lacondon people with their backs to you in their native dress. Their backs were to you because they believe cameras steal their soul. They were not “discovered” until the 1950’s and are still nomadic to some degree like the Tarahumara, the Cora and the Huichol. I have met one man who was the Grandson of the Great Tribal Leader at Na Balom, but he was not in native dress. I’m thrilled to see this photo. Another interesting fact is that the Lacondon “dust” their bodies like the Aborginal peoples do of Australia. Fascinating! Thanks. I love the Mayan culture. 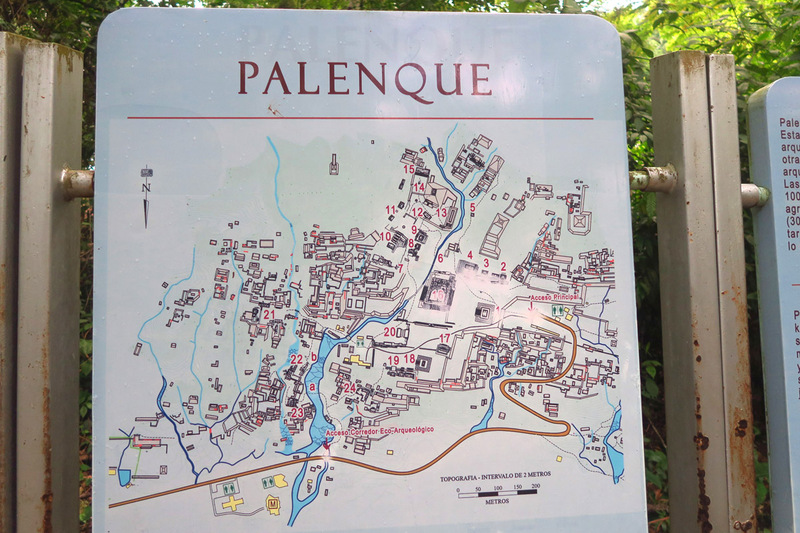 We did a 10-day archeological ruins’ tour several years ago through Mexico and Palenque was one of our favorite stops.